I had the opportunity to attend Lumenocity at Washington Park, and the show was absolutely amazing. The music, the lights, the food trucks. It was estimated that there were 15,000 people in attendance, so as you might imagine, we were elbow to elbow. This lead to some tense situations, and I was prompted to wonder about the early experiences of some of the adults in the audience. Right before the show started a fight almost broke out because someone put a chair on another person’s blanket. The person in the chair was refusing to move. Another person approached and threatened to “help” the person out of the chair. The situation was resolved by yet another person mediating and finding the person in the chair another space. I couldn’t help but wonder about everyone involved and their experiences with confrontation and problem-solving. I came to the conclusion that with quality early childhood experiences, this situation may not have happened. Had these adults been given the opportunity as young child to practice critical thinking and problem-solving? Were they taught as young children how to negotiate with others? Were they given opportunities to function successfully in a group setting? Were they taught how to reflect on another person’s perspective? Were they encouraged to use words instead of bodies to get their needs met? I think it’s important for teachers of young children to have the adult the child will become in mind. 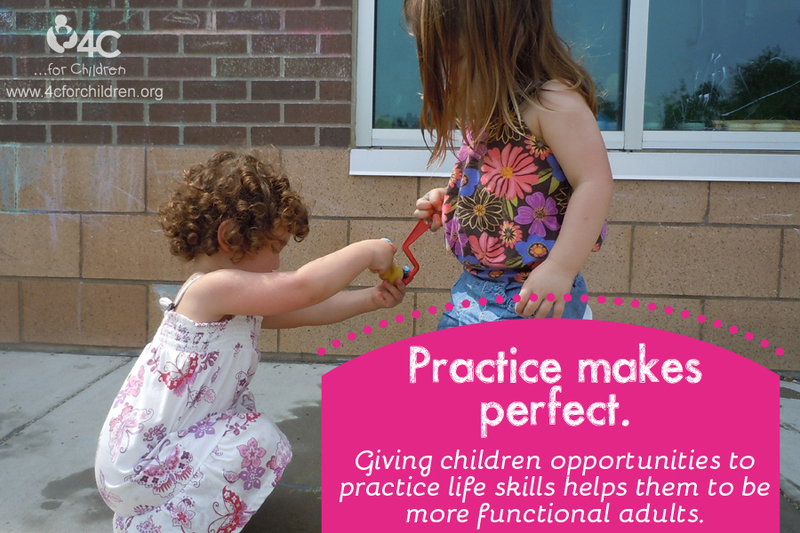 We can’t control everything, but we can provide opportunities for children to practice life skills. How? Let’s go through some scenarios. Sophie takes a rattle from Max. The teacher can wait to see if Max is upset about the situation before intervening. If Max wants the rattle he may cry. The teacher can model the words that may be used: “Sophie, Max is using the rattle. Give the rattle back to Max. Let’s find you a different rattle.” Max and Sophie may be too young to communicate by verbal language, but communication did happen. So did problem solving. Max was upset and got his needs met by vocalizing his want. Sophie was also communicating by taking the rattle. She wanted to play with that toy, too. Here’s another example. Children are told to line up at the door to go outside. There’s a mark on the floor showing children where to start the line. Ingrid stands at that line because she wants to be first. John gets in front of her. Ingrid takes a deep breath then says, “John, we can’t open the door if you are there. I am standing at the line. You have to move.” The teacher, who is standing nearby, validates Ingrid for using her words and waits for John to move. Conflict averted. Healthy emotional development is a life long process. Just like we don’t teach toddlers algebra, we shouldn’t expect them to share consistently. We don’t teach first graders chemistry formulas, and we shouldn’t expect them to not get upset when someone takes their seat. But when we start healthy behaviors at a young age, we are assisting in forming healthy adults. This entry was posted in Best Practice, Early Childhood, Infants and Toddlers and tagged child care, children, early childhood, early education, infants, kids, social and emotional development, teachers, toddlers on August 29, 2013 by Christine Fields. Supporting children through changes, big and small! The office in which I work recently moved. As the big day approached excited chatter filled the air. We planned our new routes to work. We discussed the neighborhoods and restaurants surrounding our new office and strategically planned to visit each new restaurant. We talked about decorating, furniture placement and meeting areas. In the middle of the excitement and packing I found myself becoming a little sad and a bit reflective. I reflected on all of the “beginnings” I’d had within the office. I began a new job there. I built new friendships and relationships in that office. I started a new chapter of my life within those walls and I decided I was going to miss being there. As I reflected, I started to feel out-of-sorts and a little moody. My family even noticed the change in my mood and commented that I seemed distant. I am an introvert by nature and I deal with change and chaos internally. I escape into myself and ponder my thoughts, feelings and reactions. I scrutinize everything and look for ways to calm the storm within. As one thought often leads to another I began to consider not only how I was coping with this change but I thought of all the children who deal with change and chaos on a daily basis. My change was a planned and scheduled change. I knew about it months in advance and was a part of the moving process. My thoughts began focusing on the children in our programs who sometimes don’t have the luxury of even knowing when a change, whether large or small, is about to happen. Many times children and their families are moving from place to place. Many children are going from household to household and back again as parents battle for custody. Children sometimes have no idea where the next meal is coming from. How can child care providers help our most vulnerable population deal with change? How can we support them through the chaos of life? One thing providers can do is offer consistency. Each child needs to know when he/she enters the center for the day that there are some things that will always be the same. Consistency in teaching staff means safety and security. Children need that one adult in whom they can trust and build a relationship. Children also need a consistent daily schedule and routine. A daily schedule provides some security in knowing what will happen next each day. Children need to know that each day after free play they will go outside. After they go outside they will come back inside to wash hands and eat lunch. A consistent schedule allows children to relax within the environment. 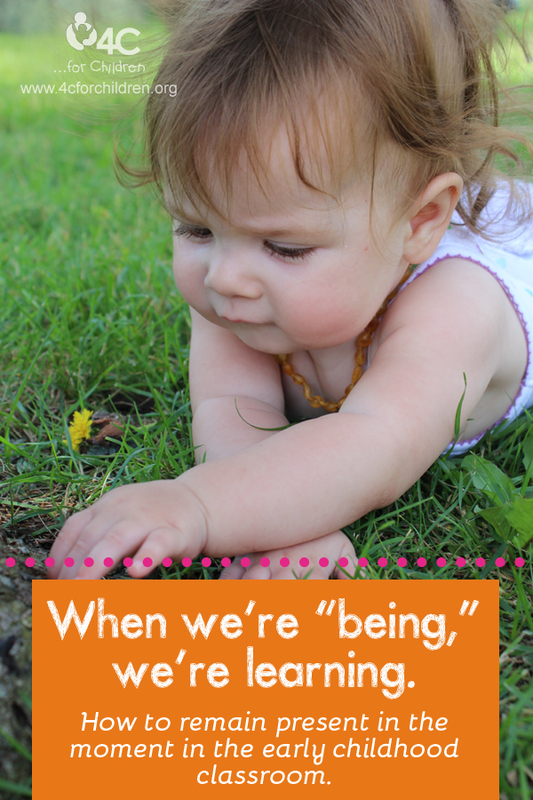 Children who are relaxed and feel secure in the environment are more prepared to learn. Providers can provide understanding and support. 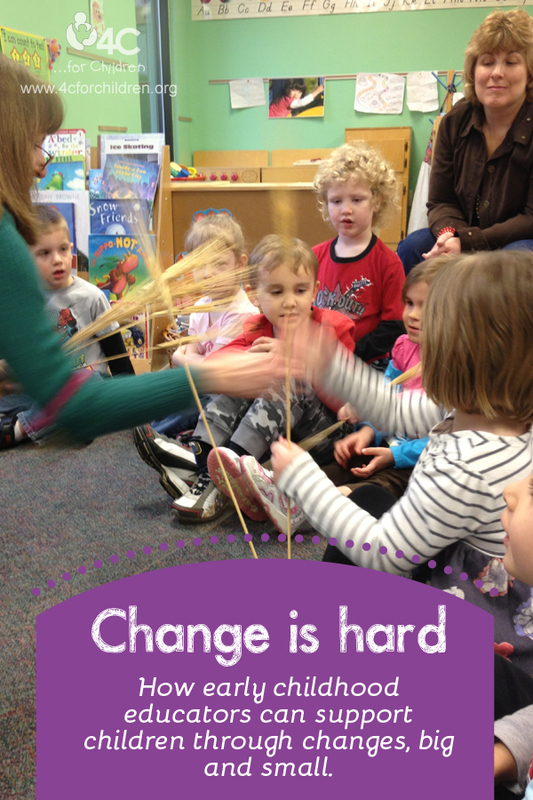 All children react differently to change. One child may adapt easily to a new baby in the home while another may experience stress and anxiety. One child may show no outward sign of stress while another may act out by screaming, throwing toys or simply by becoming more clingy and crying more often. It’s important to recognize the signs of stress and provide unconditional love and support during a time when our children need us the most. I am happy to report we are settled into the new office. We are each adding a personal touch and adjusting to the newness. In reflecting upon the last few weeks I realize that as an adult I have survived the move and I am able to move forward in dealing with the change. As providers, it is our responsibility to help children feel supported and loved during times of change and chaos in today’s ever-changing world. This entry was posted in Early Childhood and tagged child care, children, early childhood, school, teachers on July 30, 2013 by Patty Taylor. It’s summertime! The weather is warm and the sun is shining from early in the morning to late in the evening. 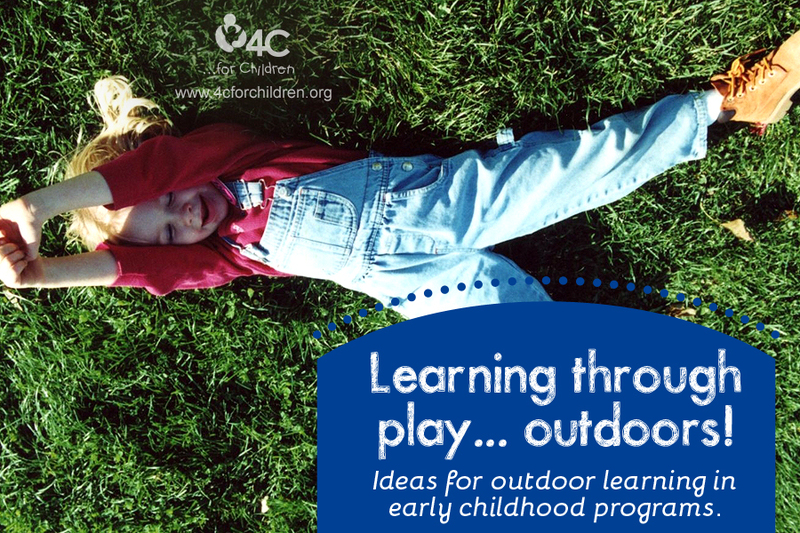 Children in your program are going to be spending a lot of time outdoors. What a great opportunity to enhance their learning! In the article “Making the Most of Outdoor Time with Preschool Children,” it is stated that “the outdoor space is an extension of the classroom and should be considered another space for learning.” There are tons of activities the children can do outside that promote learning. They can start a garden with flowers, herbs or vegetables. They can identify the different colors they see in plants or animals and the teacher can keep a list of all the things that are each color. They can investigate their shadows: tracing, measuring at different times of the day or playing shadow tag. They can even adopt a tree! Adopting a tree will be different depending on the age of the children. With infants and toddlers, the teacher can choose a tree to adopt and take the children out to visit it, touch it and talk with the children about the features, such as what the leaves look like, whether the bark is rough or smooth, if there are animals in the tree and if anything changed from the last time it was visited. With preschoolers, the children can choose a tree to adopt and visit it, but may still need guidance to make the experience meaningful. The teacher can ask the children to describe the tree, identify things around the tree, create rubbings of the leaves, experience how the tree changes with the seasons and look through magnifying glasses at bugs on the tree. With school-agers, the children can each choose a tree to adopt, visit it on their own and be given activity ideas to do independently, as well. School-agers can research what type of tree they adopted, draw a map to their tree from the classroom, identify ways they know whether their tree is alive or not, look for evidence of animals (in the past or present) and take photographs of their tree at different times. The teacher can extend the activities by asking open-ended questions about their findings. One activity can span all the various ages! In addition to doing outdoor activities, you can do indoor activities outdoors, too. Your sand and water table can be moved outside. The children can do art projects, musical experiences and dramatic play outside. Even better, story time can be taken outside, whether it’s reading a book to the children on the grass or allowing them to nestle under a tree with their own book for independent reading! This is all in conjunction with the physical activities children naturally do outside. It is essential for their healthy growth and development. Why not make that a learning experience, too? Teachers (and children) can time how long it takes the children to run around the play area three times, measure how high they can jump next to the wall and count how many times in a row they hop on one foot, jump rope or hula hoop. It doesn’t have to be a competition between the children, but they can be challenged to beat their own scores. What kinds of activities do you like doing with the children outdoors? Feel free to share them in the comments! This entry was posted in Early Childhood, Infants and Toddlers, Preschool, School Age and tagged child care, children, early childhood, kids, outdoor play, preschool, teachers on July 11, 2013 by Janine Rigg. Are you on your check list? Lately, it just seems as if life is moving so fast. It’s the end of the school year. Kids are taking tests. Schools are hosting end of the year concerts and taking field trips to local parks. There is so much to get done and so very little time to do it all. I don’t know how to get all of the things done that need to be done. I am overwhelmed. I am also task oriented, so I knew it was time for a check list. One of the items on my check list was to attend a retreat with my colleagues titled Searching for Your Heart of Gold. When I first arrived at the retreat, I had a laundry list of things that I could be getting done racing through my head. Breakfast was served and still, all I could think about was pushing forward to the next big thing so that I could hurry even faster to something else. Finally the speaker arrived and she gave an assignment to complete: define who we are. I was so grateful to have something to do so I could push forward to what’s next that I was quick to get started. But I realized that rushing through her assignment wouldn’t do me any good. I took a deep breath and slowly began to open myself up to the activity of defining who I am. We couldn’t define ourselves by the roles that we have like being a mom or our jobs. Rather we had to define what characteristics make us unique, what qualities feed our souls. I’ll be very honest, it was so hard to do. It took me many moments to define me and remember what feeds my soul. It’s something that is still on my mind, how can I take care of myself when I am losing myself in the day-to-day checklists I keep creating. After the speaker finished and we had time for lunch and reflection, I took a walk around the space we were in. The sun was shining and I literally took time to slow down and think about the things that make me, me. I am creative. I am faithful. I am observant. I am kind. I am reflective. I am a thinker. I am a reader. I am passionate. I am a planner. I am a worrier. I am loyal. I realized that in creating my check lists, I wasn’t part of the list. Everyone and everything else was on my list, but I was nowhere to be found. I wasn’t nurturing my soul so that I could continue to be the best me I can be! In the field of early childhood, there are so many check lists that need to be taken care of, observations that need to be written, toys that need to be cleaned and rotated, parents that need to be greeted, children needing lunch, tables needing to be cleaned and sanitized. I could go on. 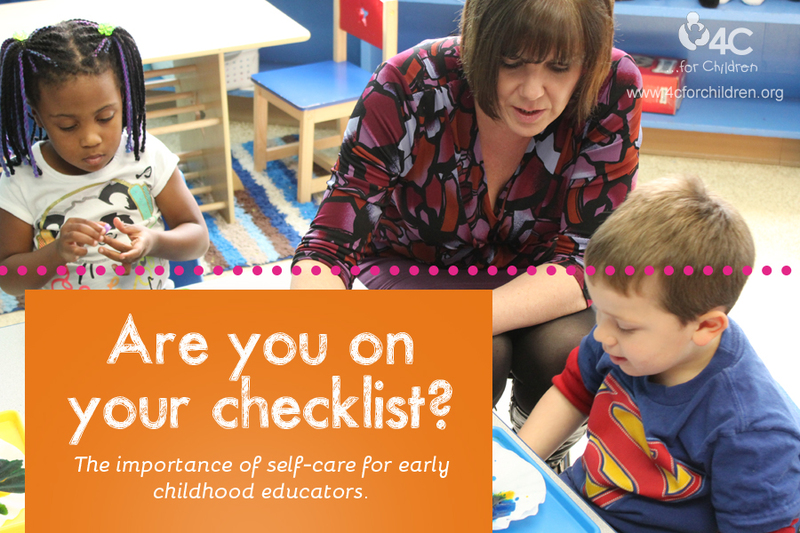 My hope for all of us professionals in the field of early childhood is that we take time to add ourselves to our check lists. Take time to care for yourself so that you can continue to be rejuvenated and refreshed in the work you do each day. This entry was posted in Directors & Administrators, Early Childhood, Professional Development and tagged child care, early childhood, education, teachers on June 19, 2013 by angiegood. 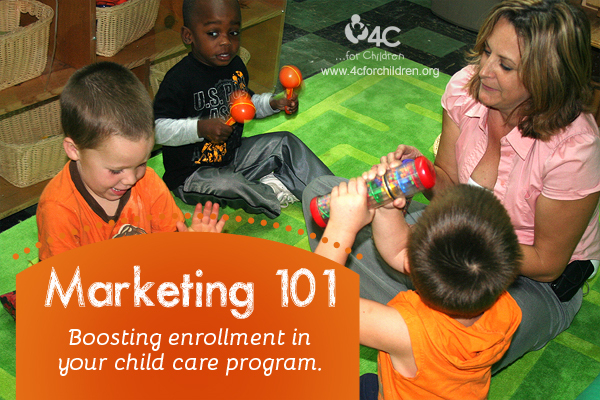 I often get asked, “What are the best ways to build enrollment in my early childhood program?” There’s no easy answer. As a matter of fact, a good marketing program coupled with a mediocre early childhood program will actually lead to declining enrollment. Why? Because a good marketing program means that people will learn sooner rather than later of the program’s poor quality. Parents are smart consumers. You can bring them in with smooth talking and glitzy marketing, but if the program is not high quality, parents will not stay. Parents will also not refer their friends, family, co-workers or neighbors unless you offer a top quality program that meets their needs and their children’s needs. There are many good evaluation tools and checklists you can use to assess your program’s quality. My favorites include the booklets published by NAEYC’s National Academy of Early Childhood Programs and the Early Childhood Environment Rating Scales. I encourage all directors to take a look at your program and make any necessary changes before beginning a full scale marketing program. You already know that it is important to know how many young children and families live in your area. However, you also need to know something about the families you want to attract to your program. What benefits and features of an early childhood program appeal to them? What is the average size of these families? How old are the children? Where do the parents live and work? Why would they want to come to your center? When you know some of these answers, you will know what types of written materials to develop for them, how to reach them when you promote your program and what to talk about when they call and visit. Once you know your parents a little better, plan how you’ll appeal to them. Do you have a brochure? How about a logo? Are you advertising in places that reach your potential parents? I was once taught the 5 P’s that may help: PRICE, PROGRAM, PLACE, PROMOTION and PARENTS. All 5 should be working together. For example, the price should be one the parents you are trying to attract can afford, and your program should be consistent with the needs in your neighborhood. And remember: what you’re marketing should be reflected in the quality of care the children in your center are receiving. Know what makes your program special. What makes your program different from, and better than, all the other early childhood programs in your area? Why do parents come to your center rather than the one down the street? However you answer this – your staff/child ratios, extracurricular programs, price or teacher qualifications – becomes your competitive advantage. It should become the foundation of your marketing efforts. Know your competition. Visit them, not just once, but periodically during the year. Find out tuition prices, their services, the kinds of families they attract and what makes them special. When you know your competition, you know what you are doing better. This becomes the focus for everything you do to build enrollment. Be careful how you define your competition. Don’t limit yourself to other programs just like yours. For example, if you are an all day child care center, are family child care homes competing with you for children? How about public school programs? It is important to look at all programs that offer services to children in your area. The last step is to develop a strategy for action. Make no mistake about it: a center without an action plan will not succeed in building enrollment. There are too many distractions in your job as director to keep you from building enrollment. So when you’re ready to get started, be realistic, be patient, remain committed, do some delegating and have fun. Action plans and knowing your target audience will get you enrollment and happy customers. This entry was posted in Best Practice, Directors & Administrators, Early Childhood, Family Child Care, Uncategorized and tagged child care, early childhood, marketing on May 22, 2013 by 4cforchildren.